We are conveniently located for students all across Ottawa. We are easily accessible by several buses and the Bayview O-Train, as well as students at Ottawa University as we are located in the city’s core. Self storage facilities are a great way for students to store their belongings in an ever-changing environment. Many students have collected things that they do not have room for, either in their dorm rooms or the revolving door of apartments that they will occupy, or at their parents’ house. Storing things at mom and dad’s house can be helpful for short periods of time, but often leaves belongings open to be examined and can make personal objects face scrutiny, possible destruction, being packed away in a basement or attic (and further destruction), or refused when the old bedroom is being reused for something else or storage room runs out. Students need self storage options in order to keep items handy. Many students leave home to attend college, and often head for other parts of the state or country to go to school. Oftentimes leaving things at home means that they cannot access them for extended periods, which may not be feasible for some personal items. 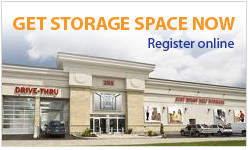 Call us today at 613-567-3333 to store with us! While self storage sounds like an expensive remedy, consider the cost of replacing items, especially those that are large or bulky. Furniture and collectibles gathered throughout the course of a college career can add up quickly if it has to be constantly bought and bought again the following year. When students return home for the summer, these items have to be left in dorms or apartments, sold, given away, packed up and taken to wherever home is for the summer, and the list goes on. Most mini storage facilities offer year-round climate controlled buildings in addition to regular self storages. Mini storages are great for storing furniture during summer break or in between dwellings. Self storages are also a wonderful way to save things that the student would like to keep past college days. If mini storage or self storage sounds too expensive, even when compared to replacing items, check the campus newspaper. Many colleges and universities offer discounts for storage facilities due to the popularity of the self storages. Checking with the facility itself, particularly those that are located near to campus, may yield other discounts as well. Some facilities offer move-in specials, specials for signing longer leases (a common option for students), first and last month free specials, discounts on packing supplies or moving trucks, and many also offer assistance with moving in and out of the unit. Take your student identification along in case of specials that require campus identification so that you do not miss something. Visit our specials and promotions page to discover big savings for students! Self storage or mini storages are also a great way for parents to store college-age children’s belongings. Once they have left home for the semester, parents may wish to turn bedrooms into guest rooms or offices, and can move the student’s things into a unit until closer to the summertime. Once the student is home for the summer (or on extended vacations), the office equipment can often be put into storage until it is needed again. This ensures that the student’s belongings are cared for and protected while they are gone, and still gives parents the ability to utilize the space when necessary. The student does not even have to know that the items are in storage if necessary, since many facilities offer packing materials and boxes and many offer discounts for services such as rental trucks. Overall, self storage has many benefits for students. Being able to store things that they’d like to keep but do not currently have room for, keeping personal items that are too big or too bulky to keep in small dorm rooms, putting things that the student may not necessarily want Mom and Dad to see in a safe place, and saving money by not having to replace furniture and large items every year are among the many reasons that mini storage may be right for your student. Being able to use extra rooms for something other than a student’s bedroom, having a place to put things that take up attic space or basement space and face destruction or the garbage pile, and not having to wonder when you will finally have use of the whole house are just a few simple arguments that convince parents to use self storages or mini storage facilities as well.